Every November, people ask ‘what are you thankful for?’ and then go on to list all the things they are thankful for. I hate to admit it, but I cringe every time I hear that question. First off, the word ‘thankful’ bugs me. It implies a sense of humbleness in the person asking the question, which is then sometimes missing in their answer. Most times their lists sound more like bragging. It reminds me of an old comic of a woman standing very proudly, wearing a sign that reads ‘I’m more humble than you’. But that’s the cynical side of me that sometimes rears up. Is ‘grateful’ a better word? I’m more comfortable with that. A little. I heard someone today say she was thankful she was a cancer survivor. That she’d won the battle. ‘Survivor’ and ‘battle’ bug me, too. I never felt like I was battling something, and don’t feel I have the right to wear a badge of ‘survivor’ and proclaim it to everyone like I had anything to do with winning a war. What I did was hunker down, withdraw, isolate with my husband and son, and wait out the time until treatments convinced the cancer to move on. I didn’t fight anything. Am I thankful the cancer moved on? Am I thankful writing came back? Or thankful for all the things we always list to answer that too-common question? Family, friends, loved ones, a roof over our heads, food on the table, etc… Of course I am. I just wish there was a word that was stronger. Not so common. Maybe it’s time to pull out the thesaurus. It is in the nature of writers to worry a word, like a dog does a bone, or a cat does a mouse. So until something better comes to mind I guess I have to say it. I’m thankful. Interestingly enough, if you look up ‘thankful’ in the thesaurus, one word that come up is ‘beholden’. Now that resonates with me. Beholden. I guess thankful feels like I’ve earned something while ‘beholden’ implies something more along the lines of gratitude. The things that mean the most to me are not things I have earned. They are gifts. And for that I am beholden. And now I’m done worrying the word. Unless some of you have suggestions to replace ‘thankful’ with. Or share with me the things you are grateful for. I’d love to hear that; I just don’t want to ask you what you’re thankful for! 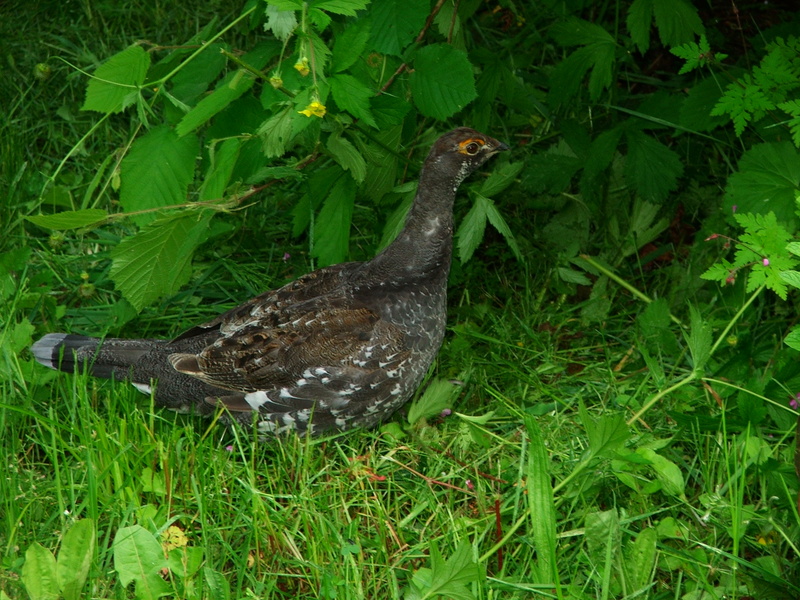 I don’t have a photo of a turkey, so hopefully this one of a wild fool’s hen that visited one day will suffice. I like “beholden” too. Like you and Anna, I feel a sense of obligation for these gifts I don’t feel I’ve earned. I don’t mind “thankful” so much but it does make me feel like I’m an elementary-schooler nodding solemnly at learning about Thanksgiving for the first time; it feels a little like a “should”: now is the time we have to produce a declaration of thankfulness, whether we feel the sentiment or not.